With the Xperia Ear Duo, Sony pursued style over substance. The result of the chase? Disappointment. The current generation of truly wireless earphones are not without their issues. Battery life is often lackluster. Connectivity between the earphones, their audio source and even between each earbud, can still be less than dependable. Then there’s the cost: As with most new technologies, a decent pair of truly wireless earphones doesn’t come cheap. One would think that the priority of headphone makers would be to find ways to bring these issues to ground. Instead of throwing their considerable resources into creating more dependable, less expensive and, therefore, more accessible high-quality truly wireless earphones, they decided that innovative industrial design and a premium price tag was the way to go. The $280 Xperia Ear Duo are the result of their efforts. While the Ear Duo’s unusual looks could make these earphones a hit with fashion conscious individuals, their lackluster sound quality, connectivity issues and high price won’t be popular with anyone. Sized at 0.7 x 2.3 x 0.4 inches and weighing 0.4 ounces a piece, the Ear Duo are reasonably light, despite their solid feel. No matter what else can be said about them, the Ear Duo are among the best-made true wireless earphones that I’ve tested. With their IPX2 rating, they’re resilient to sweat and rain. After taking a long, leisurely shower while wearing them, I was unable to detect any change in audio quality or functionality. The design of the Ear Duo is unique in the world of truly wireless earphones. Instead of hanging off of the ear’s auricle, like a set of AirPods, or nestling into the ear canal, like a pair of B&O E8, the Ear Duo wrap around the underside of the ear. 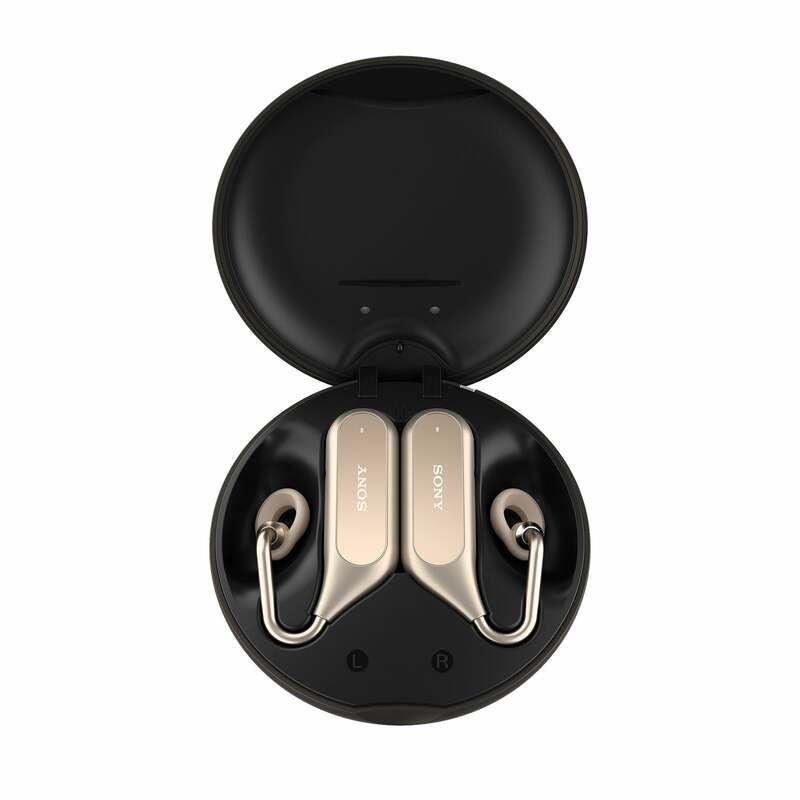 The capacitive control pad, battery and the Bluetooth radio in each of the earbuds are located in a pod, which rests against the side of the neck. A tube protruding from each of the pods is tipped with an ear piece that funnels audio into your ears. I found that this design made the Ear Duo difficult to manhandle into place. After seven days, I found them no less awkward to put on. That said, once the Ear Duo are in place, they’re reasonably comfortable and won’t fall off. No amount of jogging in place or head banging along to Flogging Molly could shake them out of my skull. The design of the Ear Duo’s battery case is just as unique as that of the earphones themselves. It resembles a skipping stone, wide and thin. It I found it easy to slide into the hip pocket of my jeans. The Ear Duo's battery case is slim enough that it can be slipped into your hip pocket. Sony claims that the Ear Duo should serve up four hours of listening time, per charge. Over the course of a week I found that they afforded, on average, just over three hours of use. I consider this to be below the standard for acceptable battery life. 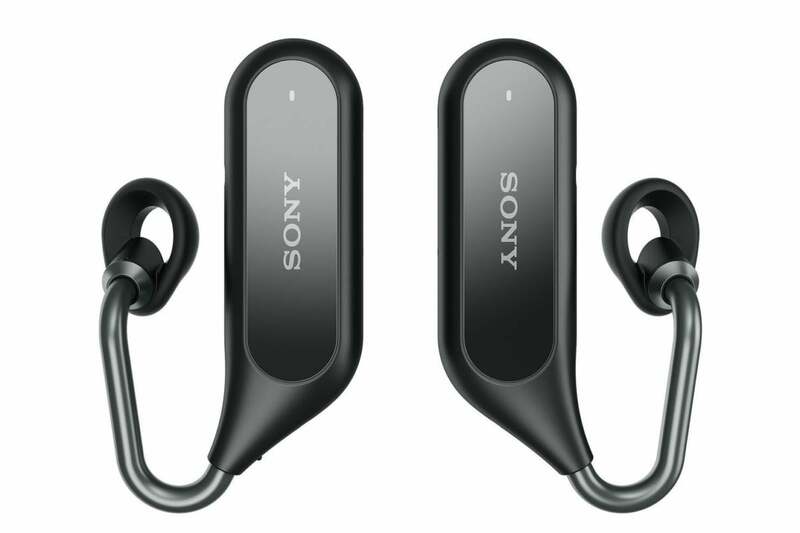 Sony claims that you should be able to eke out up to 16 hours of listening time, including the amount of battery power in the Ear Duo’s battery case. My experience suggests that 12 to 14 hours may be a more reasonable estimate. I never got used to interacting with these earphones. In order to adjust your volume, activate your smartphone’s digital assistant, or change audio tracks, it’s necessary to tap on one of the Ear Duo’s pods, which hang just behind the ear. Not once, during a week of testing, did I manage to find and interact with either of the pods on the first try. Sony likely knows that this is an issue as they made it possible, via a free iOS app, to change audio tracks or take/decline an incoming phone call with a turn or shake of your head. If controlling your headphones by shaking your head is the future, then the future is an apocalyptic hellscape of frustration. Even turning to look out a window would cause my music to advance a track. While I was able to accept calls by nodding my head, I had to do so with enough conviction that I thought I was going to give myself whiplash. You won’t find any passive noise cancellation here. The Xperia Ear Duo are designed to allow users to fully hear the environment around them while listening to audio, yapping with a friend on the phone, or interacting with Siri. While out for a walk, I could hear oncoming traffic just as well as if I wasn’t wearing earphones at all. This could make the Ear Duo a great choice for cyclists or others who want to enjoy a few tunes or a podcast but still need to keep tabs on their surroundings. Unfortunately, the level of situational awareness that these earphones afford comes at the cost of decent audio quality. While the Ear Duo produce reasonable mid and high-frequency sound, there's almost no bass at all. It made anything I listened to sound absolutely anemic. That kick drum in Queens of the Stone Age’s The Way You Used to Do? Forget about it. Worse than this, from the first time I wore the Xperia Play Duo, until the last time that I wore them, I experienced frequent disconnections from my iPhone 7 Plus. To ensure it wasn’t an issue with my handset, I also paired them with an iPhone SE and OnePlus 6 handset. The problem persisted. I expect better sound performance than this from a $280 pair of earphones. If situational awareness and a unique design are more important to you than great sound, solid connectivity, or a user interface that isn’t designed to drive you insane, Sony’s Xperia Ear Duo are the truly wireless earphones you’ve been waiting for. Everyone else should steer clear.